As a little girl from Kansas, I was a HUGE fan of The Wizard of Oz. I had posters, figures and I even dressed up as Dorothy for Halloween. I loved her singing voice. The other night, hubby and I were out renting movies when I came across the 'Life with Judy Garland: Me and My Shadows.' 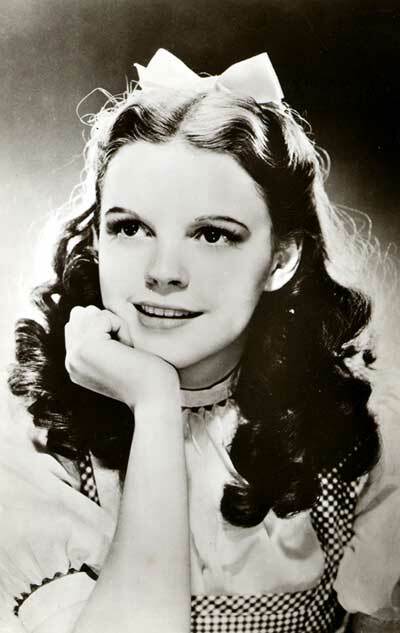 I never knew much about the girl who played Dorothy, Judy Garland's life was definitely not all rainbows. I had no idea that she went through so much in her short life. She signed onto MGM when she was 13 years old. She was called "Hunchback" and she was always looked over because she wasn't as glamourous as the other actresses during that time. MGM started her on pills to keep her thin and energetic, they even controlled what and when she ate. She was finally given the role of Dorothy Gale when she was 17 years old and they wrapped her body under the dress so she would look skinnier. From then on, Judy always had a problem with pills. Judy suffered from low self-esteem, always wanting attention and affection. She was married 5 times and she had 3 children. The movie that I watched was told by her daughter, Lorna Luft and it was very interesting. Judy Garland died from accidental overdose in 1969 at the age of 47. I had no clue that she made so many! Perfect timing, I just did a post about our Wizard of Oz party over the weekend! I love Judy, and I've read the biography written by her daughter Lorna but not seen the film. Her story is so bittersweet. It's scary how those big studios and usually fat old men controlled and helped destroy the lives of so many impressionable starlets. I also love Meet Me in St. Louis. She was such a talent, I wish she could have known it. I still haven't watched Meet Me in St. Louis, it's next on my list! Such a sad life, she worked so hard for herself and her family. I think I saw that movie too. Very sad, but still amazing what she accomplished. Wizard of Oz has always been one of my favorites too!